Hunting big bucks may be over for now but we are always thinking about it even if it’s spring. 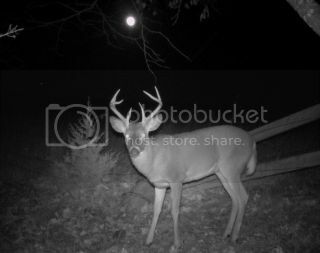 Man, here at DeerHuntingBigBucks.com we sure are glad it is spring,with the flowers and trees in bloom, and the warmer weather it’s such a fun time of the year. There is so much fun stuff to do this time of year. The fish are probably biting anything that you throw in the water. I would love to go to the river and catch a stringer full of white bass, hybrids, or strippers. They are making there way up the river to spawn. Hunting big bucks is best during the rut. Tomorrow is the first day of turkey season here in Georgia. Good luck to all you turkey hunters. I had planned on trying to go, but my wife had surgery yesterday so I won’t be able to go this weekend. I’ll get a report from my father, or step-father, and maybe even some pictures if they get one. 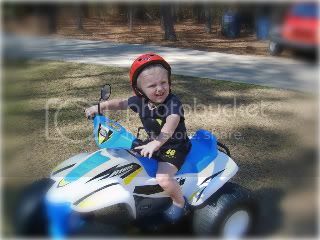 My son got a new four-wheeler for Christmas and we are just now getting him to ride it. He is doing really good to be only two and a half years old. My eight month old boy watches him everywhere he goes on that thing, he wants to ride it so bad he gets so excited watching his brother ride it. The big bucks are dropping their antlers, there have been quite a few nice ones found on our property. Also, it is almost time to plant those food plots. With a little preparation you can have some great food plots fairly inexpensive. So get out and plant those plots. It will be time to go hunting big bucks before you know it. I just love the spring and all the fun things to do, and the great weather. Now if I could just get a little time off work to get out and enjoy it. One things for sure before you know it it’ll be time to go deer hunting big bucks. Tagged Four Wheeler, Gobbler, hunting big bucks. Bookmark the permalink. Glad you’re enjoy your spring. We, here in New Brunswick Canada are still under a pile of ice and snow. So please send some of that warm weather up here. I am probably looking at another month or more before I get out for bass fishing. The thought of it has me lying awake at night in anticipation. Two of my fishing buddies are avid deer hunters but I have so far not taken up hunting. I guess I have too many things to do but fishing it in the blood and I just have to get out every chance I get. Your site has a nice clean look making it easy to read but I think it would look a whole lot better with a nice graphic header images at the top. Just a suggestion of course.